I'm not sure which board would suit this request most, so I apologize if this isn't the right place to bring this up. I recently noticed an issue displaying albums with identical artist and title info, namely concerning American Football releases. This still isn't ideal as the albums are not split in the "Album" panel, and I generally want to see albums instead of sort albums in the bottom panel (e.g. "The All Seeing Eye" vs. "All Seeing Eye, The"). Does anyone have a better approach to this? If not, what is the best way to request that Musicbee handle this more gracefully? 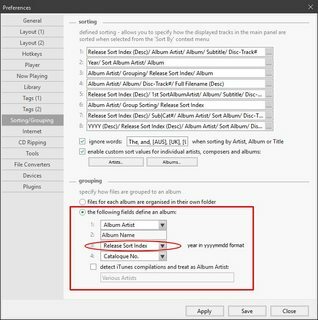 "files for each album are organised in their own folder"
"the following fields define an album:"
I use Musicbee's file organization feature, so putting each album in its own folder won't work. I was able to get Musicbee to recognize the albums as separate (I prefer to use the sort album field instead of year), but it still displays them together. 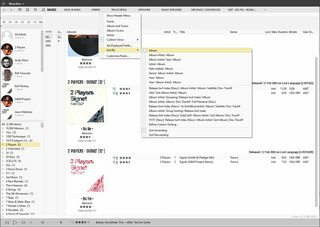 Ideally, for each album recognized by Musicbee, there should be a separate entry in the album panel and another in the bottom panel. Currently, these 3 albums are collapsed into a single menu entry. Note: I just tested this by renaming another album to match an unrelated album, and they're similarly collapsed into a single entry in the album panel. These had totally different metadata (whereas the AF albums had the same artist), so to me this seems like a bug. Your first screenshot looks it's grouped by "album". Try group by "album [year]" instead. Also I think Album & Tracks view and Album Covers view will show them separately as long as you have "year" field added to the album grouping setting. As both redwing and I have suggested, once you add YYYY into what defines an album (in the preferences panel I pointed out), you can sort and group however you want in the separate views within MB. FYI: I also use Musicbee's file organization feature and have my files sorted so each album is in its' own folder. It is possible to do. This still isn't quite right. Not only does it display the year for every album (which I don't want), but it also doesn't fix the problem in general. e.g. If two artists release albums with the same title in the same year, they'll be grouped together even though Musicbee will know they're separate albums. I explained in my first post that I tried that with unsatisfactory results. The crux of it is that there are two separate notions of an "album" in Musicbee, and it doesn't seem to me that they behave as I'd expect. 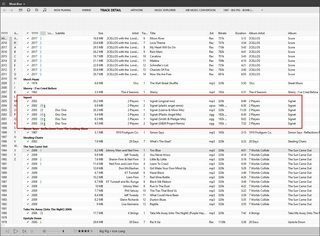 Musicbee sometimes recognizes two or more albums as distinct but places them under the same menu listing unless I use some sort of trick (like grouping by Album [yyyy]). I'm not trying to be antagonistic here, but I'm really struggling to help you out. Even if the album is named the same and released on the same day. I know what you're saying. Usually that doesn't matter but the problem arises when you're using track details view which is mainly intended to browse tracks in track level. As I said if you use Album & Tracks view or Album Covers view the customized notion of album is respected. But in track details view, you will need a special grouping field if you really want to browse them in a customized album level. I'm using a virtual tag as a grouping field that shows "<Album Artist> <Year> <Album>". You do seem a bit antagonistic imo. The first screenshot on my first post shows the result of adding a field to define what makes an album unique and then sorting by album. It doesn't work. It looks like you've done it on the "Album and Tracks" view as redwing suggested, but that's not what I wanted. I genuinely appreciate both of you trying to help me. I think there's been some frustration on both sides, but no hard feelings. At this point, I think we've pretty much confirmed that Musicbee won't/can't currently do what I want without some sort of trick or compromise. That being said, my understanding of this forum as the "wishlist" space is that I can ask Steven to implement new behavior. How do I go about getting him involved, or does he check these threads regularly? (I know he may decide not to implement it anyway, but I think it should be a simple change). The light just went on for me! What you want is for MB to follow the Album definition rules and put a separate "group by" heading (in this case: Album) even if the Album title is repeated. Steven keeps an eye on all forum posts, so just sit back and wait too see if there is enough interest (+1 votes) for him to act on this request. In that case you won't be able to disregard album definition when grouped by album name. I'd suggest, if something has to be done, adding "Album (grouped)" as another group by option (as opposed to "Album (name)") only to Tracks view. This sounds like exactly what I want! How can I vote for wishlist requests? I don't see any sort of vote/+1 option on the posts themselves. You already expressed your interest in this simply by posting the request. You can't (or shouldn't) +1 your own requests. That would only tend to make Steven ignore it. As Bee-liever told you, you have to wait and see if others +1 it and if Steven thinks the request is worthy of his time. And how easy/difficult it would be to implement. You already expressed your interest in this simply by posting the request. You can't (or shouldn't) +1 your own requests. Right, but how should I support others' requests?